Mr. Nguyen Xuan Hoa, a researcher, said that rain is a natural weather phenomenon. In tourism there is always an element of turning things that are not advantageous into advantages. Hue’s rain is disadvantageous, but it always has its own attraction, especially for people with harmonious souls. If there are more interesting experiences, combined with enjoying food, Hue will attract another line of tourists. Hue’s rain in the poem of Hai Bang is a delicious taste. Heavy rain has made the voice of Hue girls sweeter, and when one has fallen in love with Hue’s rain, it is an everlasting love. Perhaps so, even though Mr. Le Duc Anh visited Hue in the summer, he still returns to Hue to experience Hue’s rain. Duc Anh has traveled to many places throughout the country. According to his own feelings, the winter in Hanoi is a dry cold, so he has never seen tourists walking on the street wearing colorful raincoats like in Hue. The rainy season in other lands has sudden showers. The rain comes and goes quickly, so tourists often opt to find a place to take shelter from the rain, or to bring an umbrella with them. Because of the little rain, it does not cause much concern for tourists; and if it does not cause much concern, they will not remember it as much as Hue’s rain. Impressed by the image of colorful raincoats moving throughout the city, this young traveler was curious and excited. With Duc Anh, the raincoats of many colors are nowhere to be found, apart from the ancient capital. They are Hue’s specialties, just like Hue’s rain. Perhaps the tour guides in Hue deliberately choose purple raincoats for visitors to wear and discover the heritages. Long groups of tourists, walking through the ancient, mossy walls, admiring Hue is a strange image; and that image is hard to forget. Temporarily taking off the raincoat to enjoy the hot chè (sweet soup) at a stall in Dong Ba market, the young man was impressed by the ‘dạ’ (polite ‘yes’) in these rainy days, which was different from the previous times. The heavy, prolonged rain caused the ‘dạ - thưa’, characteristic of Hue people, to stretch out longer with enough weight to prevent the rain from drowning out their voice. With these distinct colors, Belgian photographer Karl Delandsheere was delighted to have captured the facets of Hue people’s lives in the rain. The young man was even more impressed when his tour guide showed him the temples in Hue, surrounded in a peaceful, lyrical scene with the rain drops falling from the temple’s rooftop. Nguyen Xuan Hoa, the cultural researcher, acknowledged that people wear raincoats can be found anywhere. However, only in Hue would raincoats accompany people throughout each winter. They are necessary to protect people’s health from the prolonged rain. It is also due to the characteristics of rain that have formed the distinct ‘colors’ of Hue people and Hue personality. The period of prolonged rain forces Hue people to take up occupations that require skill and meticulousness, such as embroidery and cooking. The rainy season makes Hue people economical when creating their own special dishes for winter. Because of that, Hue people live more carefully and deeply. Also, from the difficulties of the weather, tourism businesses have found and created products associated with rain. I Love Hue One Member Limited Liability Company shared, during a visit to Hue in the rainy season, looking at the tour groups visiting the Citadel, their reflections casting on the lake’s surface with the ancient walls behind them, the company had come up with the idea of creating a ‘photo tour’, helping visitors capture those unique images. Taking photos in the rain requires the photographer to have certain techniques. Those who register to participate in the tour are people who know how to "play" with the photographs and have a romantic soul. Mr. Tran Dinh Minh Duc, Head of Travel Management Department, Tourism Department said, “a ‘photo tour’ is a travel tour combined with photography. 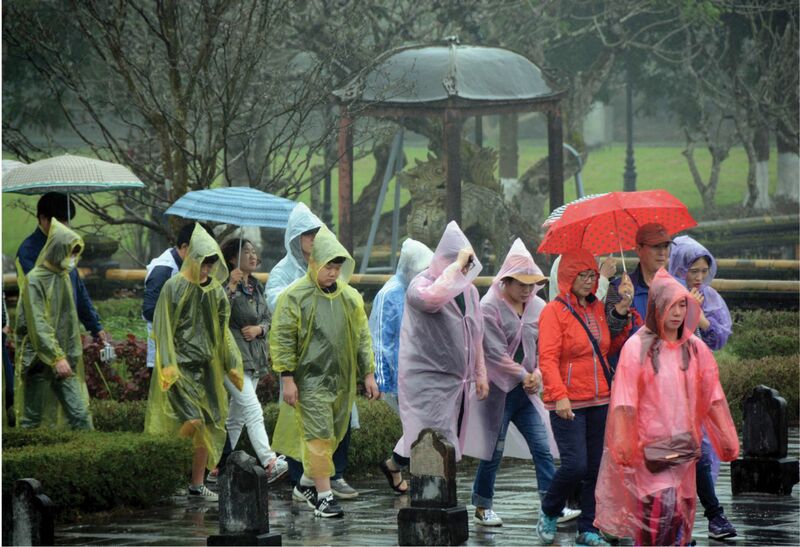 These tours have been organized in many places, but with Hue, it is always different, especially under the rain. Only in Hue can the beautiful rain scenes be captured. They are the scenes of people trading in the rain, Hue girls in the rain, and temples, tombs in the rain ... The appropriate time for a ‘photo tour’ is at the beginning of the rainy season or in the spring rain. Companies are also clever to form a unique photographic route, from Dong Ba market, the Citadel, the scene of making ginger jam in Kim Long, then stopping to enjoy tea at Tra That Teahouse in Kim Long ward (Hue City). ... 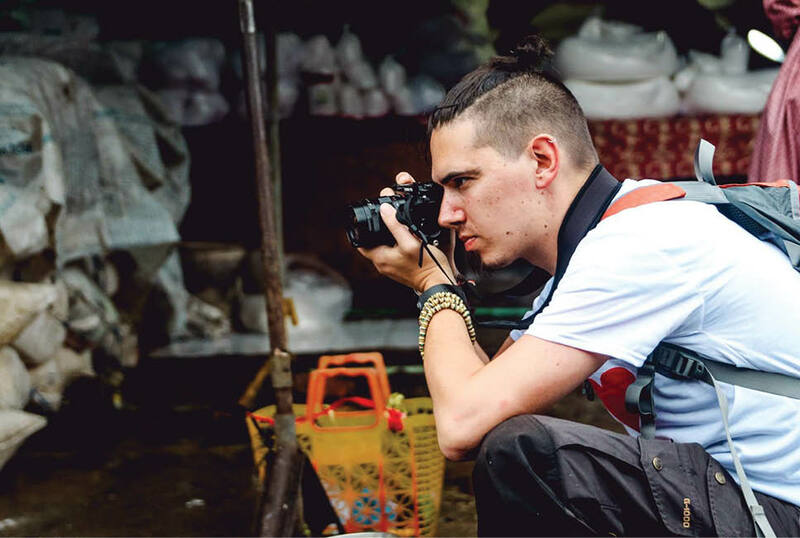 If tourists come to Hue, love the rain, want to keep the images of the rain, there are always photographers in Hue who are also ‘artists’ willing to ‘tell rain stories’ to tourists through photos. Mr. Nguyen Xuan Hoa said that rain is a natural weather phenomenon. In tourism there is always an element of turning things that are not advantageous into advantages. Hue’s rain is disadvantageous, but it always has its own attraction, especially for people with harmonious souls. Hue winter is the peak season of European and American guests. If there are more interesting experiences, combined with enjoying food, Hue will attract more potential guests, including domestic ones.